Free up horsepower and replace your worn out smog pump with UPR's Smog-Air Pump Eliminator Kit. This kit features a heavy duty high rpm press fit bearing with double seals, heavy duty hardware and snap ring to avoid failures, that all our competitors smog pumps have, time and time again. Only the UPR Smog Pump Eliminator Kit will keep you on the road or in the race every time. This new kit has the best manufactured components with unmatchable quality and performance and offering the strongest design available anywhere. Includes everything for a fast easy installation with nothing else to buy. Maintains factory belt length and works with all supercharged applications. Free up horsepower and replace your worn out smog pump with UPR's Smog-Air Pump Eliminator Kit. This kit features a heavy duty high rpm press fit bearing with double seals, heavy duty hardware and snap ring to avoid failures, that all our competitors smog pumps have, time and time again. Only the UPR Smog Pump Eliminator Kit will keep you on the road or in the race every time. Sick and tired of looking at that broken AC compressor or wanting to just drop some extra pounds from your car then check out UPR's Ultra Light AC Pump Eliminator Kit. Our kit maintains the factory belt length and works with all supercharged applications. Clean up your engine compartment and make it look good with our Ultra Light AC Eliminator Kit. Machined from 6061 Billet Aluminum, Double sealed 6203 heavy duty bearing and all heavy duty hardware. Installs in 30 minutes or less. All necessary hardware included. 1986 1987 1988 1989 1990 1991 1992 1993 GT LX V8 302 Cobra Mustang Steeda Roush & Saleen Vehicles. Brand new Aerospace Racing Billet Catch Can Kit for your 1979-2004 Ford Mustang. Developed to eliminate oil from entering your intake by engine blow-by, which channels oil and trash into your direct air stream from the valve train. This is a common problem on both brand new and especially older engines, which just suffer more from blow by due to wear and tear. 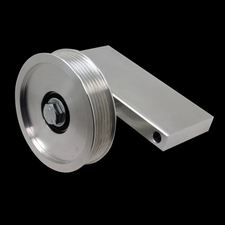 � Can measures 4.75" x 2.5"
The UPR Oil Catch Can features a three chamber design CNC machined from 6061 Billet Aluminum unlike some of our competitors models that are single chamber tanks that don't properly trap the oil or debris. 1979 1980 1981 1982 1983 1984 1985 1986 1987 1988 1989 1990 1991 1992 1993 1994 1995 1996 1997 1998 1999 2000 2001 2002 2003 2004 2005 2006 2007 2008 2009 2010 GT LX 5.0L 4.6L GT500 Cobra Mustang Mach 1 Bullitt Shelby Roush & Saleen Vehicles.